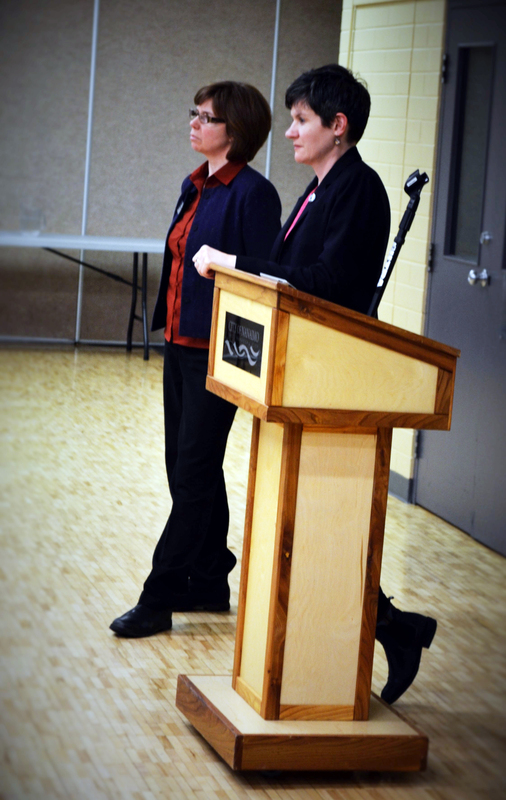 Sheila Malcolmson and Megan Leslie at the February 16 town hall event. NDP Deputy Leader and Environment Critic Megan Leslie and Nanaimo-Ladysmith NDP candidate Sheila Malcolmson spoke about the party’s environmental initiatives at a town hall event on February 16. “NDP is the only party that has a bill to meet greenhouse gas emission targets and the only party recognized by the House of Commons that is committed to putting a price on carbon,” Leslie said. In 2011, the NDP became the official opposition party with a proposition that promotes the Environment Assessment Act. According to Leslie, the Act aims to protect sustainability across Canada by ensuring projects avoid major environmental harms, to encourage cooperation between federal and provincial governments with respect to environmental assessments, and to ensure timely and thorough environmental assessments. A trigger system, where assessments occur when an environmental concern arises, is no longer in place in Canada, Leslie said. Instead, there is now a list of things (bodies of water, fish species, etc.) that are protected. This list can be changed by Cabinet. “Many things aren’t on the list,” said Leslie. For example, there have been changes to navigable water laws. Leslie also stated that changes in budgets have heavily reduced the amount of environment checks per year. She then stated that Canada can have a successful economy while still being sustainable. Leslie also addressed the NDP’s belief that there should be carbon pricing that uses a cap and trade mechanism. This means there is a guaranteed legal limit on the quantity of carbon Canada can emit each year, Leslie said. Malcolmson said she believes students and young people often live more sustainable lives and are therefore environmentally conscious. She hopes they will think about the environment and proportional representation by voting in the next election. “Proportional representation resonates with students because they want their vote to count,” Malcolmson said.